Every once and awhile I find a beading pattern that is unusually complex, one that gives me a chance to push myself to learn more about my craft. The sea foam green colored Succulent Garden Bracelet by designer Yasmin Sarfati was published in the August/September 2013 Beadwork magazine. It was fun to make and has clear and concise instructions. When I finished the three rows of “flowers” there were Swarovski embellishments to add that gave the necklace an extra pizzazz. When I clipped the thread past the last knot it was clear that this bracelet would be one of my favorites. It looks elegant, which made me laugh because I’m not sure what canine venue warrants such a dressy accent to my usual jeans and t-shirt. 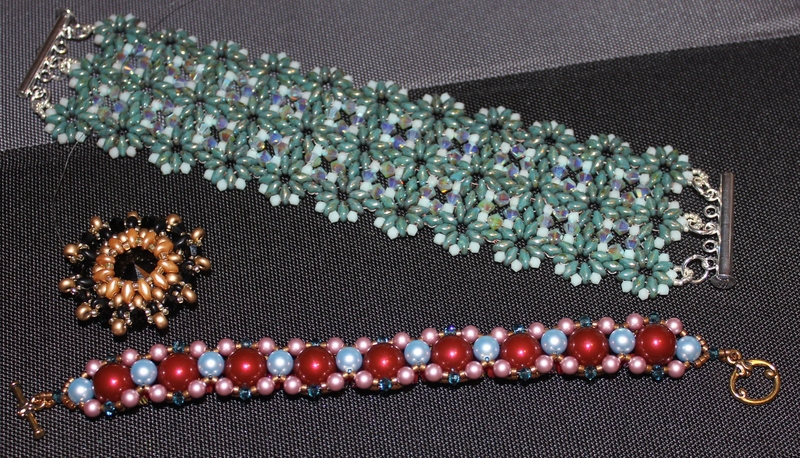 Previously I made another bracelet from the April/May 2013 Beadwork magazine called X’s and O’s by designer Maria Teresa Moran. Color combinations are tough for me since I’m not an artist but these blue, red, and rose colors I chose came together nicely. Again, I said, “Wow”, at the end of the project. Unfortunately it’s a bit small. No problem as I’ll take it apart and add another embellished Swarovski Pearl to make it the perfect fit. Yes, I’m a sucker for anything made with Swarovski’s. The round black crystal rivoli is called Supernova by designer Sue Charette-Hood, also from the same Beadwork issue as the X’s and O’s bracelet. This bezeled rivoli was easy and looks nice. You can see I still have the Fireline attached to it. Should I make a Twisted Herringbone or Russian Spiral necklace to go with it? Time will tell. I’ll set it aside for now. Fall is a time for me to reflect on change. With the cooler evenings and shorter sunny days I’ve been thinking about setting goals for the winter. While others have a bucket list with places to go, people to see, my list is closer to home, a part of my soul. Do I want to continue making jewelry for myself? I feel a pull to learn knitting and sewing. As the last quarter of my life dwindles down what do I want to do with myself, what legacy do I want to leave behind? My bucket list never dwindles but I can feel two generations of Alzheimer’s nipping at the heels of my brain cells, like a low battery warning light that cannot be ignored. It only gives me the urge to do more and more. I’m a fighter though and refuse to acquiesce to old age and the associated health issues. This entry was posted in Alzheimer's, Beading, life goals, Sheriff's Office Employee and tagged Alzheimer's, Beadwork, jewelry, retired life, Swarovski. Bookmark the permalink. You can actually Google the project names to see better pictures and other projects by each designer. For the patterns you’ll have to buy the magazines. Sorry. Oooops. When I made that comment , my pc hadn’t loaded the pic(all that was there was an X). Now that I see it, kudos! I like the black ravioli and the blue/red/rose is really fetching. What are the dogs doing while you engage in beadwork Namaste? I try to train them and run them enough that they’re tired while I bead. Some days they run and run and run. Then I’m too tired to bead. I love that they curl around my feet when I bead.